It’s been another black few days for serious crime in Nottingham. Over the weekend two young teen aged boys were shot in the Radford area of the city prompting the local police to send out armed squads of officers on the streets of Nottingham. A thought that makes me feel sick to my stomach. 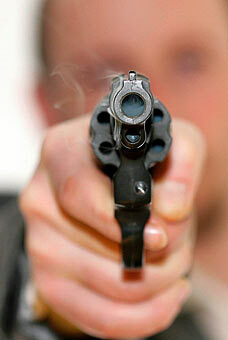 Further, there was also a shot fired on North Sherwood Street in the city centre. The street is no backwater but very much a student area and close to a main thoroughfare into the city. It is a worrying thought for me, especially as I have two female friends who live in that vicinity. Today has seen a further terrible incident. In a store on a main street right in the middle of the city a female shop assistant was stabbed. This cancer is no longer confined to a three or four notorious Nottingham suburbs but is now in the midst of decent, ordinary Nottingham folk going about their business. You know in all seriousness, apart from tragedy of these horrific incidents, this stuff can really harm the city potentially. It’s arguable that it is already. Around a year ago I did a piece of psychological research into perceptions about the city with interviews with six people who lived locally. During that research the crime figures when viewed closely clearly indicated that Nottingham was not being compared like-for-like with contemporary cities such as Leeds for instance. It was shown that even with the addition of the large residential Clifton area to the south of the city into the city figures (which it is not currently) Nottingham’s crime rating slid significantly down the scale to a more reasonable level. T hat’s just with the Clifton area – not a notoriously crime-free distract by any means, being added. When other close-by suburbs were added, Nottingham’s crime rate was a whole lot more reasonable. For example the Borough of Gedling is below the national average for most classifications of crime. Another point touched upon in the reading for the research was how it was potentially affecting the two local Universities, to the point that the Dean of University of Nottingham felt it necessary to publish a full report backed with facts and figures about Nottingham not deserving it’s crime-ridden reputation. We can think what we like about student intake in the city and we understand that not everything about it is necessarily positive for the city but it arguably remains an important factor in the city’s future prosperity. 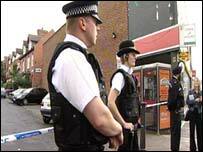 Most people in Nottingham know that these shootings tend to be localised and between gangs in the ‘usual suspect’ areas. Not that I think that is in anyway acceptable, but I think it takes on a whole new gravity when it starts to get introduced to central city streets such as North Sherwood Street. I for one am sick and tired of what this ignorant, lawless and immoral low-life are allowed to get away with in this city. Yet another bad news week eh? I don’t know how you feel mate, but I thought this week was particularly bad. The thought of armed cops patrolling our streets makes me feel pretty sad I have to say. It may not be as bad here as it’s sometimes portrayed but it does seem to be getting out of hand. My husband works in CAMHS. Some areas he works with are the obviously rough ones-and the sad fact is, those are the families with more violent histories. He worked with one child whose ambition was to go to prison because that’s where his dad and uncles were! It’s just sad, and having seen my beaten up milk man this morning, it’s scary. Plods with sub machine guns on the streets is just weird i reckon..But it seems like that’s the way things are nowadays..Shame!